While other automakers turn to diesel engines to address fuel economy, Ford’s EcoBoost V-6 will reportedly have some help next year to add even more miles per gallon to the F-150: an aluminum body. According to a report from Bloomberg, Ford will unveil an F-150 with an aluminum body next month at the Detroit Auto Show. Sources tell Bloomberg the cut in weight will push the F-150′s fuel economy close to 30 mpg. The move is seen as a big risk for Ford. The F-150 has been the best-selling truck in the U.S. for nearly 37 years and the best-selling vehicle overall for the last 32. Some doubt aluminum’s toughness and making the truck from aluminum will require an overhaul of the assembly line. Much is being made of the relationship between the new Ford F-150 and the stunning Ford concept that was on display at the last Detroit Auto Show. 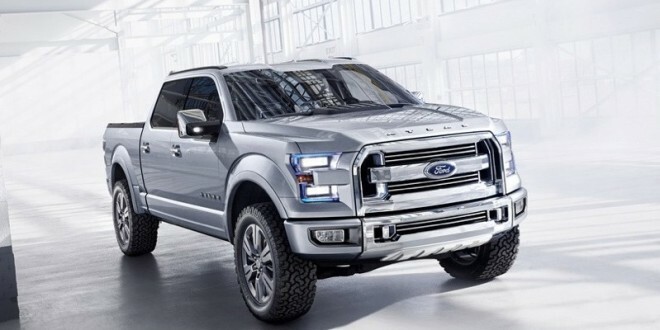 That vehicle was called the Atlas Concept, and even a company press release tagged it as “the future vision for pickup trucks.” Because the F-150 is Ford’s best-selling vehicle in company history, executives are proceeding carefully with the latest changes to its design.